I got into a discussion the other day with a friend of mine about the Decline and Fall of the Empire and he brought up a theory I've never heard before and I was wondering if there's any validity to it. Namely that the reason the empire fell was the heavy decline in birth rate brought on by infertility due to the amount of lead present in the Roman diet and used as cosmetics etc. Has anyone heard this before? Is there any validity to it? "Who Put Lead in My Pool!" I have heard that one in a lot of places. Looking past the oversimplification that holds that any one cause could produce so great an effect as Empire's Fall, or the other one that neglects the fact that it took some few centuries (not just a few generations) for Roma to come undone...how likely is it that lead in the food chain would have been a major factor, let alone the only one? -- While the Roman birthrate did fall off, lead could not be shown to be the (or even a) reason. Political and societal upheaval may have had a lot more to do with it. Conversely, urbanization, better health and greater longevity in the more settled parts of the Empire might have made having lots of babies seem less necessary. I remember reading this somewhere, but not where...and my recall of the details has probably got some holes in it. If anyone knows where the article(s) might be found, do please post it here! I think that this decline has already started in the second century AD. I read somewhere (can't remember where) that although enough babies were born, there was a percentage that was abandoned in the hills. I'm inclined to think that this was one of the main reasons why the decline took place in the first place. Transport it to modern times and look at the birth rate of Europe in the last 50 years. Politicians and scientists were starting to worry about the day that senior citizens would be a minority and the younger people were a minority. They had to open their borders and start to let immigrants in so that the population would still grow. Maybe that has happened in the Roman empire as well. Prosperity made for most people the need to have babies as unnecessary or unwelcome because they see it as a burden on their lives. They only want to live their lives without raising kids, without responsibility. Today or ten years ago, you had couples chosing not to have kids not just because of the responsibility, but also because they feared that their kids would grow up in a world that is more dangerous, more expensive and they wouldn't have much of a future. Which in my opinion has alot more to do with the fact that they believe that children with rob them of their freedom. With kids, parents can't do everything they used to do without thinking of their kids. Basicly it comes down to being irresponsible. Having said that, there will be exceptions to the rule where people are infertile or they do it out of healt reasons like certain diseases running in the family. Granted the Romans might not have known that or not fully understand it, but I do think it might have something to do with it. I agree on the lead theory. Lead alone can't explain it. Another possibility or a extension to the theory I was discussing, it that the empire might have been weakened socially, but also militairy. Alot of infighting and civil strife could have weakened the militairy as well. Which made it open to attacks. If every pagan was prosecuted and banned from certain positions, it would wreak havoc on morale in the long run. Also the introduction of non-Romans in the army would have lead to problems among the soldiers as well. Many people don't have kids. Many people can't have kids. Many people can't afford kids. Many people don't want kids. Many people are socially and environmentally conscious enough to refrain from imposing Yet Another Consumer on our already overstretched resources. Many people have realized that, due to history of abuse, addictions, or all manner of other limitations including lack of inclination, they would make lousy parents. Nobody in the above categories should be obligated to raise offspring. The experience would not be beneficial to any of the participants or to society. A child should be and deserves to be raised by a family that wants it and can care for it body, mind and soul. The next best thing is for people who can't do that to be honest with themselves and not try to raise kids. That decision can, ironically, show greater responsibility and concern for the next generation than a lot of actual parents can muster. There is a difference between not wanting kids for medical reasons and not been able to become pregnant because being infertile. For the last 4 millenia, humans were able to have babies in a world that was hostile. Do you think they thought like that they couldn't afford kids, so they chose not to have kids? Not wanting kids and not liking kids is pretty much the same if you ask me. It's a great excuse to say that they don't want the responsibility of raising kids. There are exceptions, but not many. Most of them are plain old lazy people. In a perfect world, we would grow up in a family that loves and respect us. We all know that that isn't always the case. You play with the cards you were given and live with it. I do agree with you that people should be more honest with themselves and about themselves. If they don't want kids because they're to damn lazy, than they should come out and say it and not make up some excuse about not wanting kids or not liking them. I'm generalizing here without taking into consideration that there are exceptions to the rule. Perhaps that wouldn't be a bad idea to breath new life in the symposium topic. Quintus Aurelius Orcus wrote: ... look at the birth rate of Europe in the last 50 years. Maybe that has happened in the Roman empire as well. Prosperity made for most people the need to have babies as unnecessary or unwelcome because they see it as a burden on their lives. They only want to live their lives without raising kids, without responsibility. Today or ten years ago, you had couples chosing not to have kids not just because of the responsibility, but also because they feared that their kids would grow up in a world that is more dangerous, more expensive and they wouldn't have much of a future. Which in my opinion has alot more to do with the fact that they believe that children with rob them of their freedom. With kids, parents can't do everything they used to do without thinking of their kids. Basicly it comes down to being irresponsible. Seeing as irresponsible the behavior that Aurelius Orcus described above defines a certain 3rd person point of view - of someone who feels that society's more capable people have a positive duty to pass on their genes, to preserve that cultural-biological treasure, as it were. I think it's a defensible point, actually - but a minority viewpoint these days. I myself have always been surprised that illustrious and talented people are so often the ones who have no time or interest in begetting offspring. The corollary seems to be that often it's simply the poor or struggling or talentless or - to use that word again - the irresponsible who beget the most children. We middling folk feel it to be somehow in our self-interest to do so, a contrast to the child-eschewing self-interest of the more sophisticated. Also, there is a book I've seen at the library which delves into both the myth and the history of "declining" nations, but have not read it yet. I will post its details and so on as a follow-up. Last edited by Valerius Claudius Iohanes on Sat Feb 03, 2007 3:37 am, edited 1 time in total. When I was surveying Latin inscriptions I was a bit surprised to find an area in North Africa where its funerary inscriptions showed people commonly living into their eighties and early nineties, while some lived over a hundred years. That area contrasted sharply with parts of Gaul where funerary inscriptions recorded people dying in their late teens to early twenties. There would have been a lot of factors that could account for this difference. Obviously though if the population in an area were dying at younger ages, they were not producing offspring as rapidly as in other areas. Another factor on birthrate is urbanization. Less children are needed or desired in an urban society than down on the farm. But with Rome there was also another thing effecting life in the countryside. There was a change in climate. In the middle of the fourth century the climate grew colder. Climate change in Central Asia was one factor for the migrations west. That same climate change would have impacted on Roman agriculture, food supply to the cities, and on the health of the general population. From the scant evidence i've seen, certain parts of the Empire were affect more than others. The problem areas were those along the northern borders. Then add to this that the Empire began to rely on the dwindling population of those provinces to defend the borders. The import of barabarians to defend the borders was a result rather than a sympthom of what had been going on. They were brought in to replace the declining population of those specific regions where a population decline had already posed a problem. Death rates among the younger population, the child-bearing population, increased in this period. Rather than lead poisoning, climate change may have been a main factor. Less food available, less variety of food, poorer diets, increase in illness, all of which would have added to more strife in these parts of the Empire. A lot of factors came together, but if you are looking for one potential source of the problem it may have been something as simple as the climate turning a little colder in the years leading up to the fall. On the decline in population, I completely agree that it was a major factor. And disturbingly enough we are repeating it. climate change, few good parents, even fewer people willing to become parents, wide open border with little and corrupt immigration control, and lots of envious bordering nations with fanatical warriors salivating at the thought of invading. "Caesars wife must be above suspicion!" One of my many personal hero's is Ramses the great. The guy had over 100 kids! and almost as may wives, now that is a role model! I say to all fellow Romans be fruitful and multiply! Better us than the barbarians. 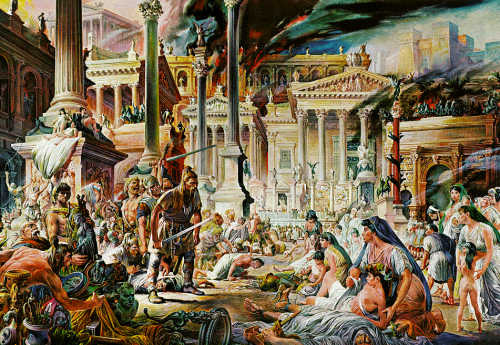 Replace the Visigoths with Jihadists and communist guerillas and that's basically my dire prediction of the fall of Washington. Remember Romans aren't born they are raised, don't raise Goths and Vandals! ...Hmm, nice picture. But, like most of even today's pictorial news sources, it's more dramatic than accurate. In later Roman times, a lot of little things were going wrong. One of them was the arrangement with the foederati and, in fact, the inconsistencies of Rome's immigration policy in general. Alaric, loyal to Rome at the time, marched on Rome to pick up his army's paychecks. They hadn't seen them in quite a while; a "little thing" gone wrong. Rome hadn't seen that kind of money in a long time; another "little thing". And She was beginning to think that having Goths for allies wasn't such a good idea; maybe She was embarrassed that She'd ever needed them, and in any case She was too proud to meet their demands. More "little things", chiefly due to prejudice. So She literally stonewalled them. Oops. Didn't work. Frustrated allied troops took by force what should have been been theirs by treaty and by right. Since Rome didn't have their money, they settled for artworks. The actual physical damage to the City was not very great. Remember, these Goths were allied to Rome, serving in Her army, supporting Her cause against *real* barbarians. The City remained populous and mostly intact until the arrival of the Vandals, who, having no stake in Rome or Romanitas, made a name for themselves destroying anything they didn't care about or couldn't understand--iow, almost everything. A bit like today's fundamentalists, of all religions or lacks thereof. true enough, but still for the roman empire this was a breaking point. But to be fare I think the vandals and Huns where far worse than the Goths and franks who where generally Romano-philes for the most part. I couldn't find a good picture of the vandal invasion, dam crafty Germans and their fire ships, that Byzantine invasion fleet should have crushed them! god help us in 100 or so years, I am starting to think we are living in the 3rd century! > True enough, but still for the Roman Empire this was a breaking point. Indeed. The inconceivable had come to pass; the City breached, and barbari inside the gates for the first time in 700 years. It was understandable from the social, historical and policy standpoints; the laws of consequence applied then as now. But it was the worst possible blow to morale, and morale was about all Rome had left that year. > God help us in 100 or so years, I am starting to think we are living in the 3rd century! Let's show 'em how it's done!! "Bene'st; but, since we've lived through the Third Century once already, we ought to be pretty good at it by now. Let's show 'em how it's done!!" Well said, I hope to do just that. Its not as if I spend all my time talking about the good old days. I like to think that we as human beings should take an active role in shaping history. I can say one thing if barbarians try to invade my city I will go out like Constantine XI or better yet Aeneas. Has anyone read the books by Peter Heather and Adrian Goldsworthy dealing with the fall of the west? The former is of the opinion that Germanic supertribes created by Hunnish invasions were the main culprit. The latter believes that Roman civil wars and internal strife was the ultimate culprit. I see points both make and perhaps feel both are partially correct. But some of the other theories out there - declining birth rate, lead poisoning, climate change, plague - these are things that we really don't have enough data to measure, and don't seem by themselves sufficient enough to overthrow a society. I always wonder if it wasn't simply a concatenation of evils, of one thing after another, that kept the West ill and poor and reeling, where the East found enough resources and talent to continue on. Taken together, the lists of evils are daunting: military civil wars, barbarian incursions, military rebellions & secessions, plague & devastation, economic decline, and finally outright barbarian seizures of Roma herself. And I myself always think of a 'Battle of Midway' paradigm - the supposed dominant power, under assault from unexpected problems that are initially easy to handle but grow in severity and frequency, finds they keep piling in until its commanders don't know which way to turn and make some errors in judgment. And then the problems for Roma were more than strictly military, as the West's economic power and sheer numbers in population slipped and slipped and slipped. But as I said, I should read up on the latest views. After much reading and study, and not a few brainstorming sessions with people, I was watching a lecture on the history of Rome and while going through the various "causes" of the fall of the Roman Empire in the west I realized what was a viable simple answer to the question, "Why did Rome fall?" That answer is, "One damn thing after another."